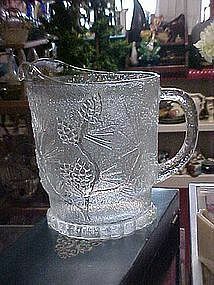 Ponderosa pine pattern, 74 ounce pitcher by Tiara. This one is clear and in perfect condition. Measures 8" to the top of the lip. Decorated with branches of needles and pine cones. Very lovely pitcher. We have more pieces not yet listed, just ask.